Are you an armchair gardener in winter? I sure am. I love to dream about what to plant for this next season. Here in the No. Hemisphere, this is prime planning season. And in the So. Hemisphere, it's time to seek out u-pick farms and road-side farm stands, for great deals to put away for your winter. Garden centers at stores like Wal Mart and Home Depot will have rhubarb roots and bare root berry bushes/canes and plants later this month. Now is a good time to research the fruits that do well in your climate. If you look for disease and pest resistance, you'll have save yourself a whole lotta trouble down the road. Growing your own doesn't work for everyone. Assess your own space, time, and energy. You may feel you want the whole orchard, or just a rhubarb plant or two, or maybe none at all. Take heart non-gardener/non-orchardists! You can stock your freezer in summer when the price is right on cases of fruit. For the months of January, February and March, I buy very little in the way of fruit, just some oranges and bananas. Yet we enjoy fruit every day in winter. How so? We are eating our stash of fruit that we froze in summer. We began our fruit garden rather simply, 17 years ago this spring. We knew we wanted some fruit, but had no idea just how much we could grow, how many varieties we would choose or just how we would work this all into our ornamental garden plan. We started with 3 measly rhubarb roots from the garden center near us. Two weeks later I got the bug to add 3 blueberry bushes. A month after that, I bought 3 strawberry planters and a bunch of bare root plants. And that was Season 1. Our fruit garden had begun. You can see that we were hooked! We've added many other types of fruit, and continue to seek out new varieties, and develop areas of our yard to take "just one more". Below is a rundown of the best of our fruit garden for freezing for winter use. 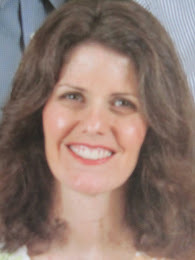 I hope that some of this information can be helpful to you. I'll start with rhubarb, because it grows practically anywhere that there's sun. Rhubarb has few pests, has no pits or cores to remove, and doesn't require any special treatment except washing and chopping before freezing. For us, we've appreciated that the squirrels, birds and slugs take no interest in our rhubarb. Those three are our garden's biggest pests. I have 7 rhubarb plants. (I began with 3, have divided over the years and given several plants away. I'll be giving more away this spring, too.) I freeze about 8-12 quarts of chopped rhubarb every summer. If you lived near me, I would be more than happy to set aside a division this spring. 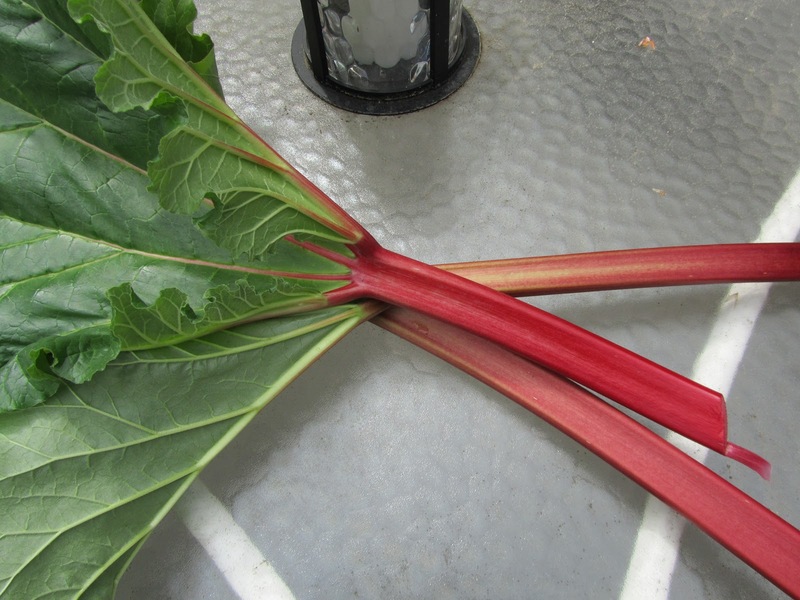 Ask friends and family who have rhubarb in their gardens, if they'd like to divide one of their plants for you. If you plant rhubarb this year, don't pick any until next year. The roots need a year to develop enough to withstand harvest. In winter, we use frozen, chopped rhubarb in rhubarb custard pie, rhubarb-orange muffins, rhubarb oatmeal, rhubarb crisps and cobblers, and as rhubarb sauce (like apple sauce) to pack in lunches to go. We knew we had just enough space for 1 plum tree. In a rental, several years ago, we had a couple of plum trees, Italian Prune being one of them. We saw first-hand how prolific these trees are, and knew that we wanted one in our own yard. All of our fruit trees are semi-dwarfs, using very little square footage, are easier to harvest, and mature to bearing faster than standards. Italian prunes are a type of European plum that dries well, due to a high sugar content. The European plums keep fresh longer than the Asian plums, and tend to ripen over a longer stretch of time than the Asians. Last summer was a bumper crop, to be sure. We harvested about 6 grocery bags full of plums! I did get quite tired of all the pitting and chopping. But now that it's winter, I am very grateful for all we have both frozen and dehydrated. In winter, I use the frozen plums in jam, cobblers and crisps, fruit sauce. With the dried prunes, I make stewed prunes, or chop them to add to homemade granola, oatmeal-"raisin" cookies, and bread stuffing for poultry. Blueberries are too precious for me to just use in cobblers and crisps in winter. I reserve these for snacking on frozen, baking into muffins and pancakes, or to stir into yogurt and smoothies, so that we get the maximum blueberry flavor. However, you may live somewhere blueberries grow in abundance. We began with 3 blueberry bushes, planted up against the house for maximum sun. Our bushes never did very well, until we moved them out into the yard. We had lasagna-gardened a new spot up with layers of mulch, and compostable material like catalogs and paper. This is very rich soil now. The very first year we moved one of the bushes, we had a bumper crop of berries. And the berries were huge, too. 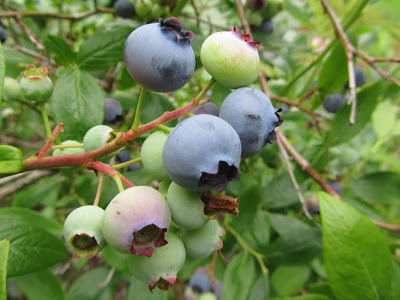 My thought is that the soil is not only rich here, now, but also moist, and away from the alkaline concrete foundation of the house (blueberries are acid-lovers). I also keep the ph acidic by dumping all of our coffee grounds around the base of the blueberry bushes, year round. Birds love blueberries. But netting over the bushes slows them down. We have 8 blueberry bushes, all worked into the ornamental landscape, and 4 are still babies. Last summer, we ate blueberries fresh for several weeks, and froze about a quart of blueberries for winter use. Strawberries are fairly prolific here. I freeze several quarts of them every summer for adding to yogurt and smoothies. I could make jam or add to cobblers, but their flavor is so delicate I prefer to savor them uncooked. We began with 3 terra cotta strawberry pots, filled with about 3 dozen plants. The terra cotta pots did not work for us. I wouldn't recommend them for strawberries, but they are great for herbs. After a couple of years of practically no berries when the plants were in the pots, I moved them to the ground and the copious harvests of strawberries began. I use bird netting over the plants to slow down the squirrels who have a sweet tooth, and beer baited slug traps, throughout the season for those slimy guys. Strawberries are one of the fruits on the "buy organic" list, due to high levels of pesticides and fungicides used. Growing your own guarantees you organic berries. And the bonus is, homegrown berries taste loads better than farm grown -- soooo flavorful, all my kids will agree. We've only been growing our own raspberries for about 5 years now. They are fabulous! I didn't think we could grow them here, due to their dislike of soggy soil. So we put in raised cedar beds, and they have been doing very well. Summers of 2010, 2011 were bumper-crop summers for us. We froze about 2 gallons of raspberries. Last summer we had plenty for fresh eating, but only about a quart of berries for the freezer. It was a cloudy and cool summer here. We have 5 apple trees, one still immature, the other 4 producing. Varieties include: 2 red eating apples, 1 pippin apple (good fresh and baked), 1 green apple (baking, good storage apple), 1 russet apple (excellent flavor for fresh eating, baking, and long storage, a late ripening apple). 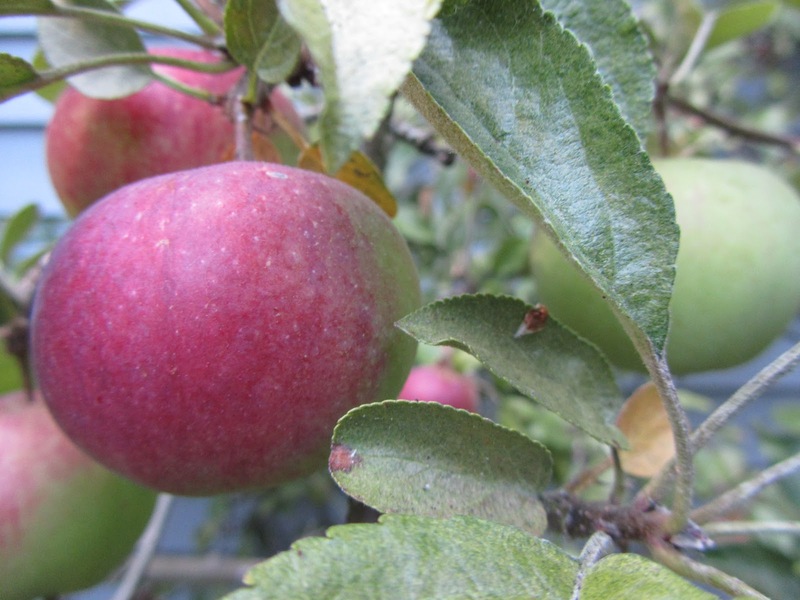 We chose apples with a broad range of ripening, from late August through late October. Most of our apples we eat or bake with fresh. A few, however, get knocked off the trees by squirrels, so I pick those up and chop them for the freezer right away. In winter it is so nice to have these chopped, frozen apples to add to quick breads and curries. 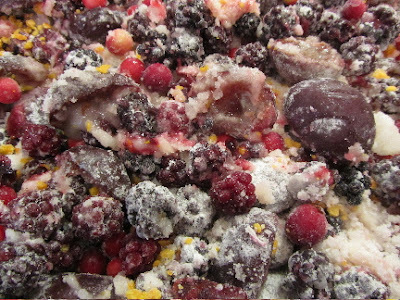 Of course, there's the traditional cranberry sauce accompaniment to holiday dinners, but I also use them in quick breads, harvest pie (very similar to mincemeat in texture, with dried fruits and chopped nuts) and mixed fruit cobblers. 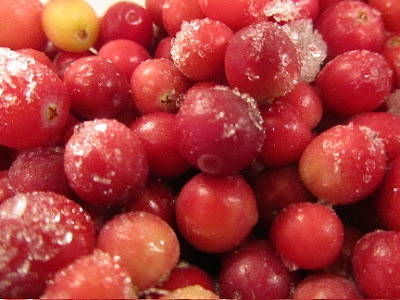 A little goes a long way, so my gallon of cranberries harvested and frozen in October will last all through winter. If you'd like more info on growing cranberries, I wrote this post last fall. We also have pear, sweet cherry, fig, and crabapple trees, as well as red currants and huckleberries. But I don't think of those fruits as for the freezer. Some we eat fresh in summer or fall only, and some is for jelly, and one is strictly for the birds (I've never been able to beat the birds to the huckleberries). Every locale (except the concrete jungle) has some sort of wild fruit available for picking. In the Pacific Northwest, we have wild blackberries. They are everywhere. I live in the midst of a very large bramble hedgerow here. Not picking the blackberries seems downright foolish. Yet I know many folks who won't even try them ("those aren't real fruit, a farmer didn't grow them" sort of attitude). We pick as many as we can every August and September. I use them in jam, pies, cobblers and crisps, smoothies, and in blackberry sauce. 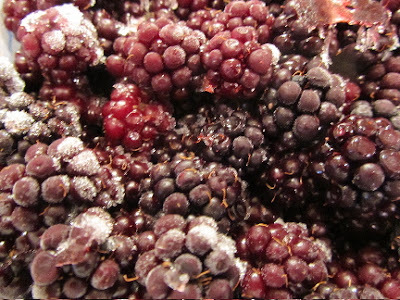 This past summer I froze about 20 quarts of blackberries. What grows wild near you? Have you ever foraged for the wildies? All this is about more than just saving money. I like that I know what is on our fruit (we don't spray or use any chemicals whatsoever, and we're totally fine with some blemished fruit). And I like the sense of security we have here, that no matter what else happens with our finances, we'll always be able to put food on our table. Do you freeze fruit in summer for winter eating? What is your favorite fruit to freeze and how do you use it? If you grow any of your own fruit, what advice would you offer someone just beginning with a fruit garden? Is there any fruit that has done especially well for you? 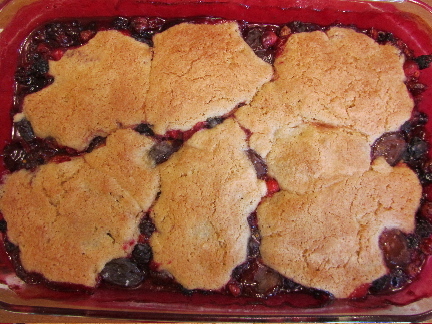 I love blackberry cobbler and wait for the wild berries to get ripe every summer. While the cultivated blackberries are good, I don't think they equal the taste of the wild ones. And that's a very good point about wild fruit, it often has much richer flavor. When we first moved here, we were told about the wild blackberries, and so never even bothered to buy any supermarket ones. I think I've only had cultivated blackberries in pies in restaurants. Mmmm, now you've got me thinking, a blackberry pie would be good tonight. I'll have to go raid the freezer stash! 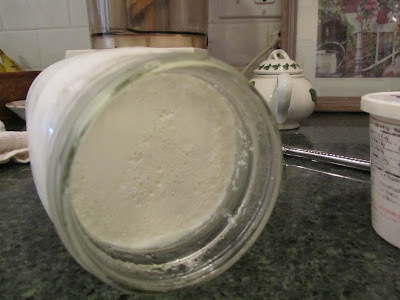 Timely post--I made cherry sauce for our pancakes this morning! These are from 2011 (U-pick orchard) because last summer was a bust for us for cherries. My husband is the gardener around here. For some reason rhubarb doesn't grow well for us, and we get enough strawberries and raspberries to eat as dessert in the summer but not enough to freeze. We don't have a large enough yard for lots of fruit but since we live in fruit-farming country, we rely on U-pick (blueberries, strawberries, cherries) and the farm market. My in-laws have peaches and pears so they gift us with fruit as well. It is such a treat in the winter to pull fruit from the freezer! I think strawberries are a great "beginner's" fruit to grow--for several years we even grew them in a pot by our entryway. Kids love to pick and eat them! Mmm, homemade cherry sauce, that must have been quite a treat. So much better than the canned stuff in the supermarket. That is so great that you can get so much fresh produce in summer, from family, your own yard and all the farms nearby. The flavor can't be matched in a grocery store. And it gives you variety in winter, at a bargain price. We also use u-pick farms for things we can't grow. For us, that's corn mostly. Our yard is just too cool, and we have raccoons. For fun and freshness, u-pick is the way to go if you can't grow it yourself. I would love to go to a cherry orchard for u-pick. That would be so much fun. While we have sweet cherry trees here, it's a battle with the birds and squirrels. I'll have to look into u-pick cherry orchards in our area for this next summer, if I can't keep the hungry critters away. Yeah, I think you're right about strawberries being great for beginners. They do produce with so little effort or cultivation, and quickly - that first season or the next. My currants are very seedy, so I use them for jelly. Do you grow your own currants? And are they not so seedy, so you can eat them as is, or in baked goods? I may try to use some of them in muffins or scones next year and see what we think. They have such a delicate flavor, I'd think they'd be delicious in ways other than jelly. Beautiful photos of hyacinth on your blog this week. They must be a breath of spring in these still cold winter weeks. well,the currant comes from my garden.I grow red,black and white currants.My currants are seedy,too.But my husband and I we like the flavor.And I make jelly too. A slice of fresh homemade bread with butter and currant jelly is for me the heaven on earth! I have red currants and some black (but the black have never produced well for me). I'd like to add white currants. I mostly make jelly with the currants, but I also like to use the leaves from the black currant bushes in tea. They add a nice flavor, and are known to boost health. Learning more about herbal teas from what I can grow in my garden, is something I want to focus on this next summer. Thank you for all the information. I was planning on putting in some rhubarb plants this year, I grew up with rhubarb in the small garden we had and miss it but I didn't know you couldn't harvest it the first year, I would have ruined my plants had I not read this. My favorite fruit would have to be strawberries, as an adult even when I didn't have anything else I always had a few strawberry plants. Of course apples are mandatory in any diet I would think so we planted two dwarf apple trees last year. Rhubarb has been fairly easy for us to grow, and we've come to really appreciate it. When everything else is having a bad year, the rhubarb is always there. Fresh picked strawberries have simply the best flavor. I have been spoiled now. Supermarket ones are so lacking. They may be big, but with no flavor! Another couple of years and your dwarf apples should begin producing. You and your grandkids will have so much fun picking them. And the flavor and crispness of fresh apples can't me matched in the supermarket. Your little garden, there, is growing bit by bit. I'm looking forward to seeing the photos this spring and summer. My brother used to rent and live in this old farm house and it had several varieties of fruit trees. My favorite ones were the cherry trees. Sadly, the old farm house was torn down to make way for a new highway and the trees were destroyed. Have you ever read any of Bob Waldroup's information online? He has turned his Oklahoma yard into one like you've described, with a lot of plants & trees for food. Too bad about the farmhouse and trees destroyed. It's always sad when something that feels like history for the area is torn down for something as ordinary as a highway, however useful to commerce and community that highway may be. No, I've never read Bob Waldroup's info. I'll check him out. Many years ago I read a book titled The Edible Landscape. I found the idea very intriguing. So instead of planting only ornamental trees, we chose beautiful but very useful, fruit-bearing ones. And some fruit plants are lovely in their own right. Blueberry bushes have beautiful fall color. Rhubarb has those large leaves that have an almost tropical look in the landscape. Strawberry plants can "run" and cover an area as a ground cover, while still giving fruit. And some fruit trees have a weeping habit which looks so graceful in the landscape. I'll check out the links you provided. Thanks. We forage for something called briar berries. Don't know if that is the proper name or not. I've never heard them called anything else. My grandfather used to pick a wild onion that he called ten fingers. I can't find any information about them so I definitely don't know how to tell you how to spot them. We want to start planting some fruit bushes and trees this year. We've just not reached a consensus on what to plant. Briar berries, I've never heard of them. Are they like a bramble berry, with the many lobes (raspberry, blackberry, boysenberry), or more like spheres such as blueberries and huckleberries? And do you find enough to make jelly or jam, or freeze some for winter? In the early years of the US, that is how people procured berries, they foraged. Families would go out for an entire day, and make a picnic of it, picking all day long. I like that idea. And so, what have you decided to plant this year? In your climate you have some different fruits that you can grow, than we can. Would you also plant nuts there? The planning is the most fun part, except of course, the eating! yes I want to know more! Also can you send photographs of your fruit beds etc. I'm interesting in real people's layouts. In our yard, we've worked as many of the fruit bushes and trees as possible into the general landscape, seeking out the best spot for the needs of each fruit. The exception to this has been the raspberries and strawberries. The raspberries need us to keep an eye on underground runners and we wanted them in raised beds, so they have their own spot. And the strawberries we wanted to keep in contained areas as well, so we can protect them from the squirrels as best as possible (there are a few remaining spots with strawberry ground cover in the yard). But even the currant bushes are just worked into an ornamental area well-suited to their habits. I'll take some photos to give you an idea of what we've done so far. It's always a work in progress. It's great that you grow so much of your own. I'd like to see a photo of the layout, too. Here in Nova Scotia we have wild blueberries, raspberries, blackberries and cranberries. do you go out an pick in the wild? Having all those berries available would be wonderful. The wild blueberries are supposed to be not only more flavorful, but higher in anti-oxidants than cultivated. I'll get some photos of our yard and it's layout up very soon. Yes, I can either pick my own, or buy from the farmers' market from others who pick! Frozen wild blueberries are sold in 5 lb boxes year-round. They are easy to commercially harvest - the bushes are so low, the berries are raked off! I have seen rakes marketed for cranberry picking. I have thought of making one for myself out of a plastic 1 gallon milk jug, to speed up the process of harvesting. We live in South Florida, but are originally from MN. I miss the rhubarb and crisp, tart we used to get there. I used to take my children to the strawberry U-Pick farm. They loved peeking under the leaves to find the berries. Strawberries warm from the sun - YUM! They are the best. I made a Rhubarb Upside-down cake that my son would request as his birthday cake - it's that good. Here, we get fruits and vegetables almost all year round - much from S. America. Many folks grow citrus, but our yard is too small. 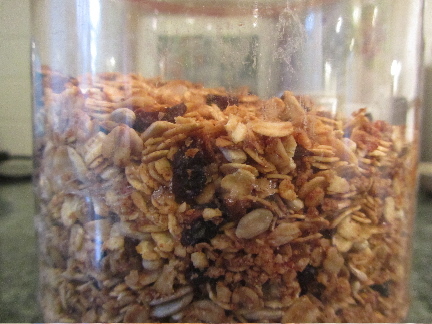 There is no great way to preserve it for later, we just eat seasonally whatever comes in. We do gets lots of free mangoes from friends and I cube and freeze the fruit for smoothies year round. Now my mouth is watering......!! Mangoes and fresh citrus, now that sounds very refreshing right now! I've never made a rhubarb upside-down cake. That sounds delicious. I can't believe that we're just a couple of months away from rhubarb season here. I'm going to have to give your cake a try. I'm guessing that it is much like pineapple upside-down cake, but with the rhubarb and a bit more sugar in the fruit part. I tried growing strawberries on the balcony but the plant only ever produced one and then died, now I know it's probably because I didn't water it enough. I have been snacking on mangoes that I froze a couple of weeks ago, and have been thinking I need to freeze more while they are in season. I want to stock up on some more plums to make jam as well. Yeah, lack of water will do that to strawberries. Your balcony might also trap a lot of heat, which would be hard on the berries. Have you ever tried growing a dwarf citrus on your balcony. I would think a potted dwarf lemon, orange or lime would do well for you. Valarie (the comment just above yours) is in So. Florida. I'm thinking that your climate is much like hers. She freezes mangoes when in season, to use in smoothies the rest of the year. You are in the prime season right now to buy cases of produce to can or freeze, to use when your winter rolls around. Are there u-pick farms near your town? That's always a fun outing and the produce is fresher and less expensive.